The next time you are walking by any body of water, listen and look closely in the trees around. You may hear a unique call or see a bird you thought could only exist in a nature documentary. 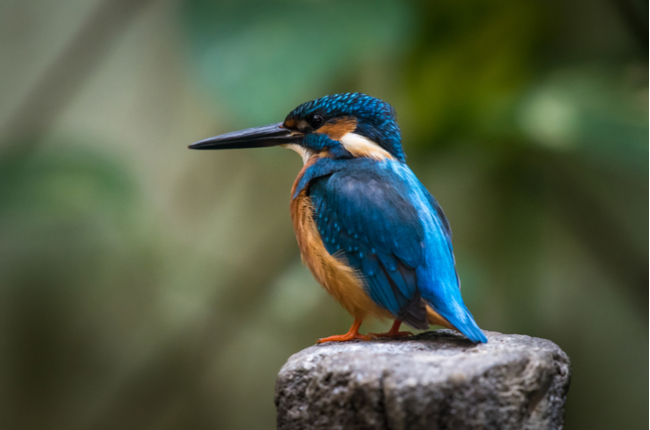 The kingfishers are some of the most interesting birds in nature. Kingfishers generally sport brightly coloured plumages and possess sharp pointed bills to firmly grasp their prey. They can often be found perched on branches not too far from waterbodies where they survey the landscape for potential prey. The largest kingfisher found in Singapore is the Stork-billed Kingfisher (Pelargopsis capensis). Growing up to 37 cm in length (slightly taller than an A4-sized paper) it can also be found in the Indian sub-continent and across Southeast Asia. It is easily recognised by its distinctive grey head and orange underparts, in addition to its thick red bill and blue upperparts. It is an uncommon resident to Singapore, but if you are lucky, you may spot it in mangroves and large water bodies at places like Sungei Buloh Wetland Reserve and the Singapore Botanic Gardens. Its call can be described as a cackle or a series of six to eight descending whistles. The White-throated Kingfisher (Halcyon smyrnensis) is one of the most common kingfishers in Singapore and Southeast Asia It is highly adaptable and can be spotted along the fringes of reservoirs, as well as open fields and secondary scrub far from water. It grows up to 28 cm, making it one of the bigger kingfisher species found locally. In addition to fish, it also preys on large insects and small animals. Found in Northeast India, Southwest China and mainland Southeast Asia, the Oriental Dwarf Kingfisher (Ceyx erithaca) is an uncommon migrant in Singapore. This species inhabits wooded areas, sometimes far from water, and may be spotted in the Central Nature Reserve and surrounding nature parks between the months of October and March. A colourful and petite bird that grows to about 14 cm, it has yellow underparts that contrast with its dark blue upperparts and bright red beak. Its call is a shrill, high-pitched whistle. The Black-capped Kingfisher (Halcyon pileata) is the only kingfisher found locally with a black head and red bill. Its neck, throat and breast are white and it has an orange belly and blue upperparts. Found across much of the Indian sub-continent and East Asia, the Black-capped Kingfisher is an uncommon migrant locally; it is very shy and will flee at any disturbance. It is found in freshwater and coastal wetlands like Kranji Marshes and Sungei Buloh Wetland Reserve. Like many other kingfishers, this species smacks its prey against a branch until it dies, making it easier to swallow the prey whole. Bones and indigestible materials will be coughed up into a pellet. The Blue-eared Kingfisher is a shy resident of forested streams and ponds in Singapore. It looks similar to the migratory Common Kingfisher, but can be differentiated by the lack of a rufous ear patch and intense blue upperparts. This small kingfisher, measuring only 17 cm in height, often gives it presence away by its call – a thin ringing ‘tseep’. It is usually observed perched on branches overlooking a stream, occasionally diving into the water to catch fish. It is also known to eat small insects and reptiles. This medium-sized kingfisher is widely distributed throughout Asia, but is an uncommon migrant in Singapore. There is also a small resident population on Pulau Tekong. It can reach around 25 cm in height and is the only kingfisher found locally with a uniformly purple-brown plumage. There is a blue stripe on its back and rump, generally visible only in flight. Both male and female birds look similar although the plumage of the male bird is brighter than the female. During the migratory season from October to March, this kingfisher may be observed in forested areas such as the nature reserves. Widespread across much of the coastal Middle East, Indian sub-continent, Southeast Asia and Australasia, the Collared Kingfisher is the most commonly sighted kingfisher in Singapore. This bird grows to about 24 cm and its upperparts are mostly blue, broken by a thick white collar, and a black bill. Originally a bird of the coast, it has adapted very well to the urban landscape and can now be found all over the island, even in the heart of the CBD. Its call is variable, but most commonly heard as a series of five to six harsh ‘kip’ notes, described by some as a maniacal laughter! The Common Kingfisher can be identified by its small size, turquoise-coloured upperparts and head, orange underparts and white throat. The male has a black bill while the female’s bill is black with an orange lower mandible. A common migrant to Singapore, it can be found across much of Eurasia. It usually hunts from an elevated perch such as a low tree branch over a waterbody, bobbing its head. Look for it around all types of water bodies such as streams, canals, reservoir edges, ponds and mangroves. Its call is a high-pitched ‘tseep’. To help identify the kingfisher, look at the colour combination of its plumage. The size of the bird is also a big clue, with the Stork-billed Kingfisher being more than twice the size of the Common Kingfisher. Lastly, you can also listen to the bird’s call. Please email wong_yeang_cherng@nparkss.gov.sg for more information on our internship programme.